I’m so grateful that my kids love beans as much as they do. And this 13 Bean Soup Recipe gives me an opportunity to provide them with a healthy and delicious soup that is not only full of nutrients, protein, and fiber, but it’s just 5 Smart Points per serving – which is great for me! It’s also a really filling soup, so perfect for when you really need to satisfy your hunger without going through all your Points. 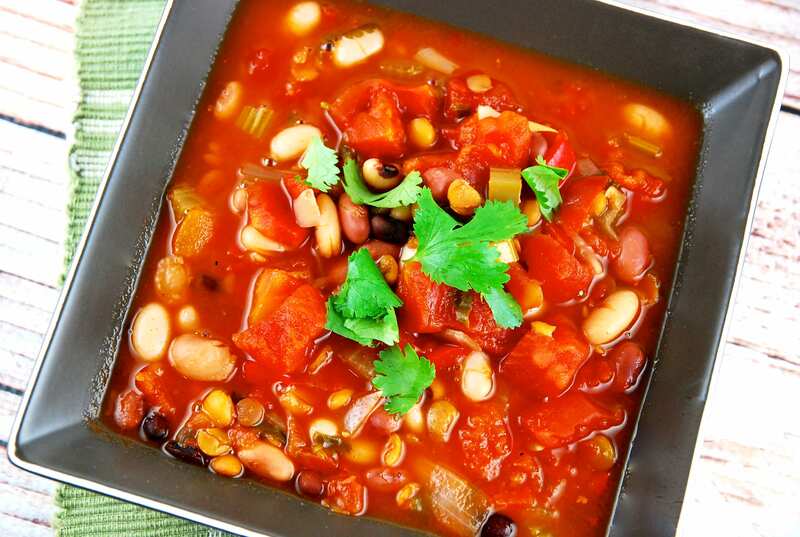 This 13 Bean Soup is also incredibly easy to prepare. You can really use any dry bean mix that you like. I’m personally a fan of Bob’s Red Mill bean soup mix, so that’s what I use. It also freezes and reheats really nicely, so if you have any leftovers, it’s great for lunches or when you need a meal in a pinch. A simple, yet hearty soup that is wonderfully filling and satisfying. This vegan dish is loaded with protein and fiber, and is perfect for feeding a crowd. Rinse beans, then cover with water in a large bowl, and let soak overnight. Drain and rinse beans. Bring the 10 cups of water and beans to a boil. Reduce heat to medium low and let simmer for about 2 hours or until beans are tender. Add in onion, carrot, celery, tomatoes, garlic, cilantro, chili powder, salt and pepper. Let cook for another 30 minutes. Serve.